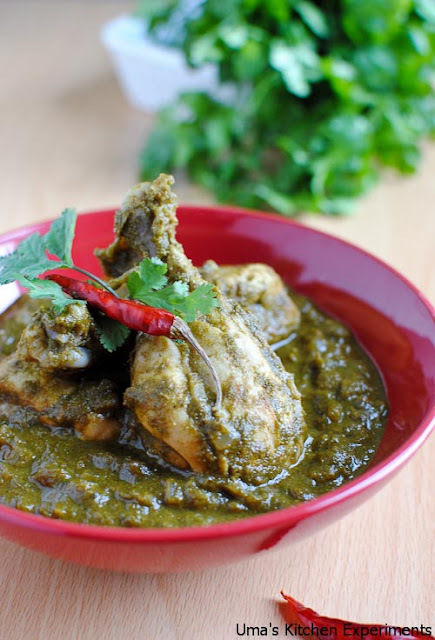 If you love the freshness of coriander leaves and its taste, then this chicken gravy is for you. I love coriander flavor a lot. Whenever I see fresh coriander, I pick it without fail and prepares this thogayal which is my family favourite. After making the thogayal this time, I used the left over coriander to make coriander chicken gravy. I didn't add any other aromatic spices to the gravy to maintain the flavor of the coriander. 1) Mix all the ingredients given for marinade in a large bowl or Ziploc bag. 2) Mix well so that the masala coats well to all sides of the chicken pieces. 3) Keep inside the refrigerator for 30 minutes to 8 hours(overnight). 1) In a kadai / non-stick pan, heat oil. 2) Throw cumin seeds and allow them to splutter. 3) Add onion and 1 slit green chilli and fry till they are translucent. Make sure onions are completely soft. 4) Add ginger garlic paste and fry for a minute or till the raw smell of garlic disappears. 5) Add chicken marinade along with the curd in it. 6) Stir and cover. Cook in low flame for 10-15 minutes. Chicken pieces will leave out water at this stage. 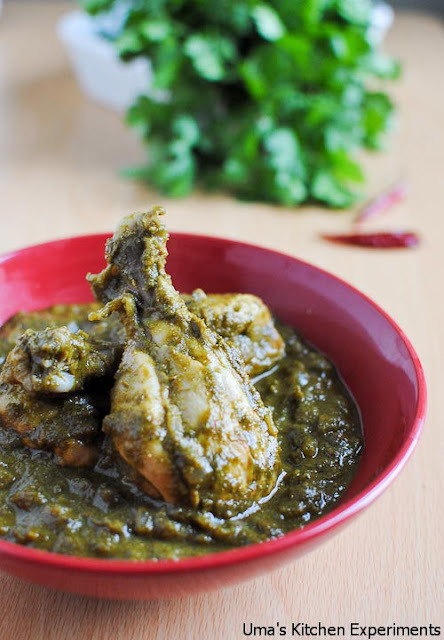 7) When the chicken is cooking, grind the curry leaves along with coriander leaves and remaining green chilli. Keep it aside. 8) Check the chicken now. If it is half done, then add tomato, red chilli powder, coriander powder and salt. Stir well. 9) Cook till the raw smell of masala disappears. 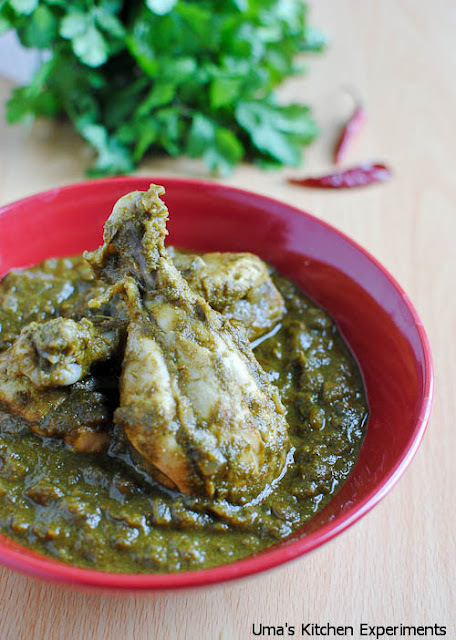 10) Add coriander leaves paste to the chicken and stir well. Make sure not to burn the gravy. 11) Cover again and cook in low flame until the chicken is completely soft, well cooked and the oil separates from the gravy. You will get chicken in medium consistency gravy at this stage. 12) Taste and adjust the seasoning as per preference. 13) Serve hot with chapathi or steamed rice. 1) Add more coriander leaves if you like. 2) You can also grind all the green chillies along with coriander leaves. 3) Add roasted poppy seeds while grinding if you prefer. 4) Instead of tomato add a small pinch of soaked tamarind and grind with coriander leaves. Or skip both if you dont' like the slight sour taste in the gravy. Linking this recipe to Julie's event EP Series ~ Herbs and Spices monthly series titled "Coriander and Cumin"
Yummy looking coriander chicken, I love the coriander flavor as well. Pics are awesome Uma..
very flavorful n yummy chicken recipe...too tempting!! Inviting chicken !! looks very tempting !! Yummy n very tempting chicken,looks so inviting. Color and gravy looks awesome..love it. The photographs are beautiful here. I love coriander and this dish is going to taste wonderful. I tried this it came out really delicious... Thanks for sharing.